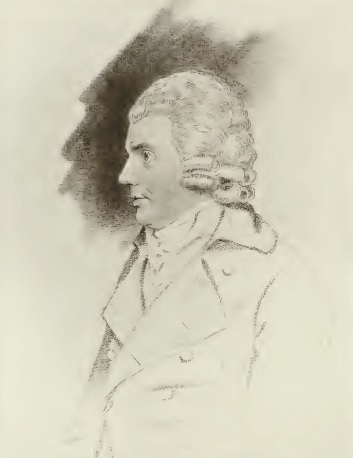 Hugh Downman was reputedly born in Newton House, Newton St Cyres; he was however baptised in Alphington in 1740. After attending Exeter School, he entered Balliol at Oxford and was ordained in 1763. A couple of years later he changed careers, and went to Edinburgh to study medicine. He was later awarded an MD by Aberdeen University. He was appointed physician to the Devon and Exeter Hospital in 1771. Later that year he married Frances Andrew, daughter of John Andrew MD, a senior Exeter hospital physician, and his wife, Isabella (sister of 1st Viscount Courtenay). That same year he published the first of six volumes entitled “Infancy”, a guide to child care written as a poem. Clearly more of a poem than a practical handbook, he extolled the value of letting nature take its course, recommending breast feeding, and not giving medication to babies. How best sustained, the muse proceeds to sing. In plenteous rills, abundant is the store. In 1779, on the grounds of ill-health, he gave up his hospital appointment, and took to writing more poetry and plays, although he returned to medical practice about ten years later. In about 1791 he formed a literary society in Exeter, known as "The Society of Gentleman". This group of self-styled intellectuals met every few weeks over a meal to discuss philosophy, science and literature, often submitting contributions in essay form. Initially there were just nine members, it was later enlarged to 12. Other members included Rev Richard Hole of Farringdon, William Jackson, Exeter Cathedral organist, Rev Richard Polwhele, Bartholomew Parr Jr (physician), John Sheldon (anatomist and balloonist), Rev John Swete (Oxton), Rev John Hayter, (Chagford), Rev Gilbert Burrington, (Chudleigh), John Codrington, Exeter apothecary, General John Graves Simcoe, Captain Sebastian Emmett and William Kendall, poet. The society prospered for about 12 years, but was closed down when Downman's health again began to fail in 1808. By a codicil to his will dated 9 June 1804 “...whereas a Mine of Manganese since the making of my said will has been and now is working on my estate called Ford in the parish of Newton St Cyres…” Hugh Downman directed that any proceeds should go to his widow. He died in Exeter in 1809, his widow in 1822. They had no children. 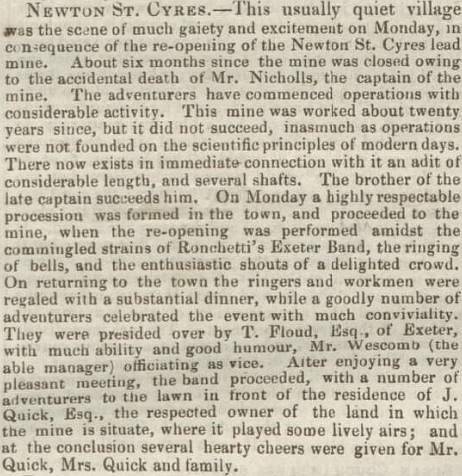 Mining had taken place in and around Newton St Cyres on and off since Roman times. First Lead was extracted, later Silver and finally Manganese. Some of the shafts were 26 fathoms (over 150 feet) deep. The mines were located along a geological fault line running East to West from Huxham (near Stoke Canon) to Woodley (South-west of Newton St Cyres). The main period of Manganese mining around Newton St Cyres was between 1796 and 1810, when these mines supplied most of the Manganese used in England. Manganese was used originally in glass making, to remove pigment to create clear glass. In 1826 there was a proposal to extract Lead, Silver and Manganese from a lode 2 feet below the surface and 3-8 feet deep. Quicke's Lead mine was revived in 1853, but William Phillips Nichols, the "mine captain" died when he fell down a shaft. The mine reopened six months later with his brother in charge. The lode was reopened between 1872-9, by the Sims brothers. In June 1888, The Langford Manganese Company was registered with capital of £10,000 in £1 shares; It started trading a year later. In 1890 the company announced that it was unable to find manganese of marketable quality and it went into liquidation the following year. 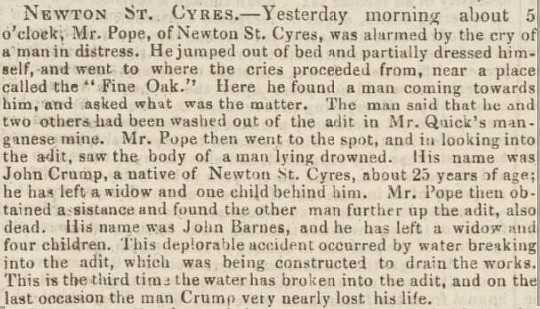 John Crump was a miner, born in Newton St Cyres in 1820 and baptised in the parish church. He married Susan Horrell in Exeter in February 1841; they then lived in Exwick. His father John was also a miner, one of 14 shown with that occupation in the 1841 census of Newton St Cyres. On 24 March 1842 before dawn he was working in an adit to John Quicke's mine with John Barnes 42, another miner who lived in Christow. Both men drowned when water in a shaft flooded the adit. Barnes was buried in Chagford, his birth place. 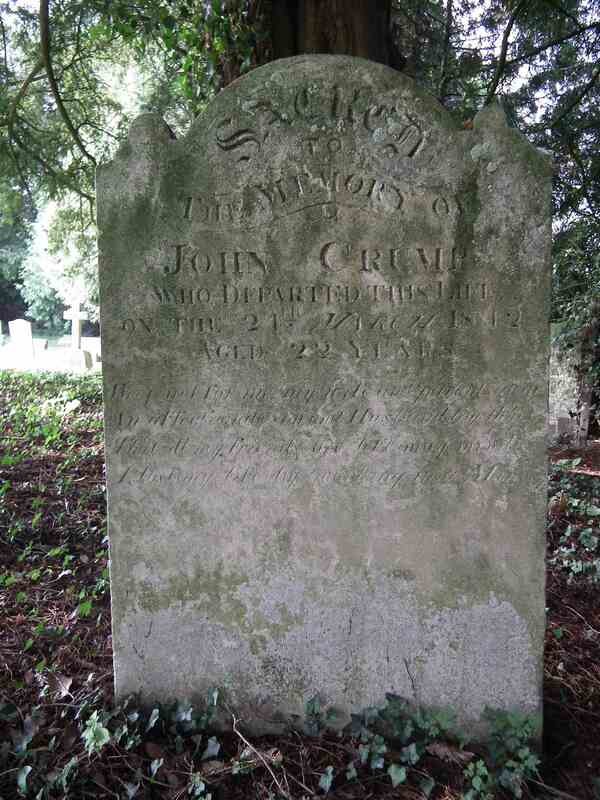 John Crump, 22, - who had been married just one year - was buried in his family's section of the graveyard at Newton St Cyres. Click on the image (left) to see detail of his poetic epitaph.